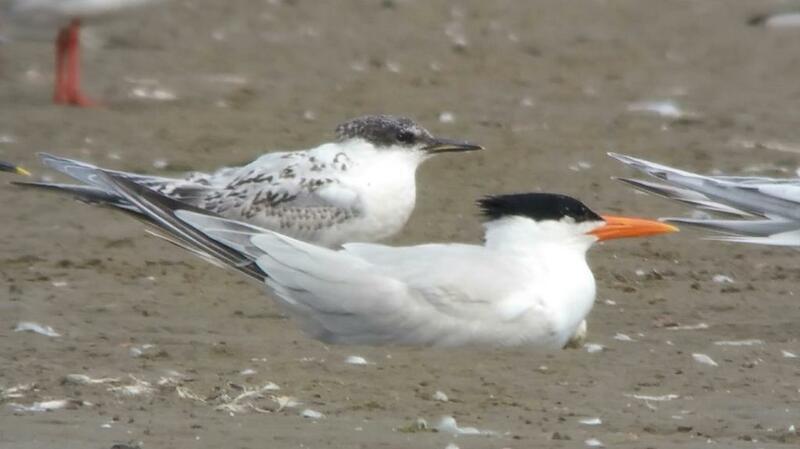 Scientists and conservationists have confirmed the existence of a 'new' species of tern. Royal Tern (Thalasseus maximus) was previously considered to comprise two subspecies: American maximus and West African albididorsalis. Wildlife conservationists in The Gambia have long suspected that West African birds were distinct, and now scientists at the Universities of Aberdeen and Montpellier have used DNA analysis to confirm that they are indeed two different species. The research, published in the Biological Journal of the Linnean Society, analysed DNA sequences of feathers and other remains of West African Royal Terns from Mauritania and from islands off Tanji Bird Reserve, The Gambia. It was the first time that the DNA of albididorsalis has been sequenced. The researchers found that the DNA of West African Royal Tern matched most closely to Lesser Crested Tern (Thalasseus bengalensis). 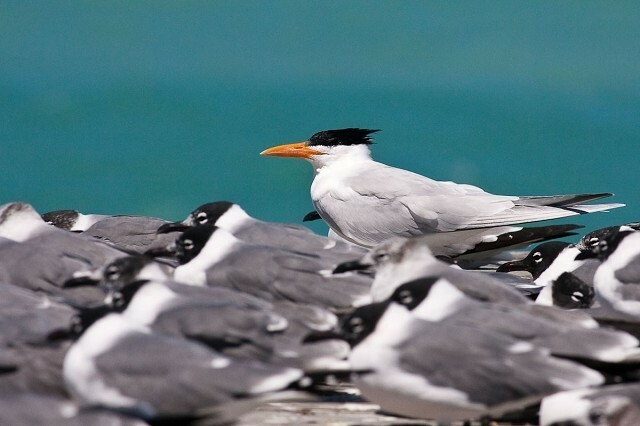 Therefore, in spite of the strong morphological similarity between albididorsalis and maximus royal terns (it is currently widely accepted that the two are almost inseparable in the field), they are not each other's closest relatives. Simultaneously, the distinctly smaller and readily distinguishable Lesser Crested is in fact the sister taxon of albididorsalis. Surprising genetic results are not unprecedented among Thalasseus terns. Though the results of the study come as a surprise and the splitting of royal tern into two morphologically near-identical species will inevitably pose new challenges for field birders, it only reflects the 2009 findings that the near-identical (at least in adult plumages) Palearctic Sandwich Tern and Nearctic Cabot's Tern were genetically distinct, which led to their treatment as separate species. The latter was found to be genetically closer to the distinctly different-looking Elegant Tern (Efe et al., 2009). The discovery could have immediate conservation consequences for West African Royal Tern, as its population is threatened by the erosion of its breeding grounds due to climate change and human activity. The results of the research will be presented to international conservation authorities in a bid to have its conservation status re-evaluated. 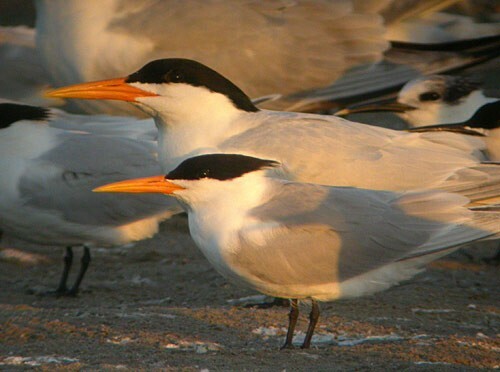 Professor Martin Collinson, from the University of Aberdeen's Institute of Medical Sciences, explained: "West African and American Royal Terns have long been considered the same species. They look pretty much identical to each other except the American Royal Tern is on average slightly bigger with a slightly redder bill. "This research should have an impact on the West African Royal Tern's conservation status. The breeding grounds in The Gambia and Senegal have been massively eroded by storms and the encroaching human population, so the West African Royal Tern is under threat. Conservationists in The Gambia can now take this information to their Government and potential donors, and call for help to protect this West African endemic species. "It's information that can inform conservation priorities. There is a limited pot of money and information such as this helps determine where it should be allocated. It is important to direct conservation funds to preserve the maximum amount of genetic variation and genetic biodiversity, in addition to understanding the inherent societal, cultural and economic importance of the birds themselves." Efe M A, Tavares E S, Baker A J & Bonatto S L. 2009. Multigene phylogeny and DNA barcoding indicate that the Sandwich tern complex (Thalasseus sandvicensis, Laridae, Sternini) comprises two species. Molecular Phylogenetics and Evolution 52: 263–267.